Yeap! It's time for food again! 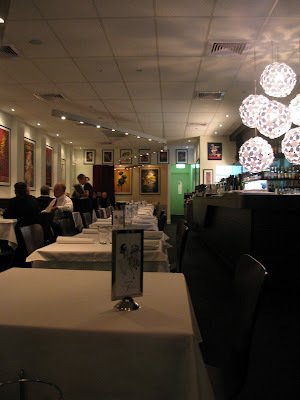 I went to Bistro Felix yesterday with a few of my friends, Joe, Alice and Khrys. 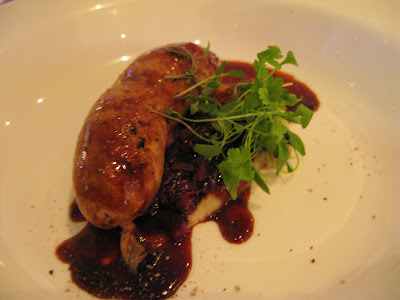 We never been to Bistro Felix before but we heard some good reviews from other people, so we decided to give it a go. Friendly service & good atmosphere. I would categorize Bistro Felix as fine dining but the waitress that served us that night didn't give me an impression of professional. 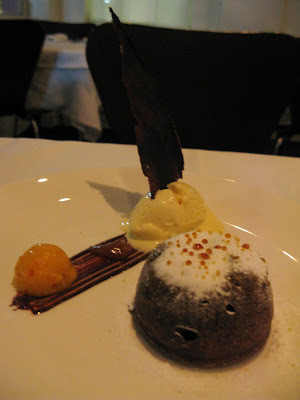 Don't get me wrong, she is really friendly and nice but compared with other fine dining restaurant that I've been to, she gave me an impression that she is not a professionally trained. 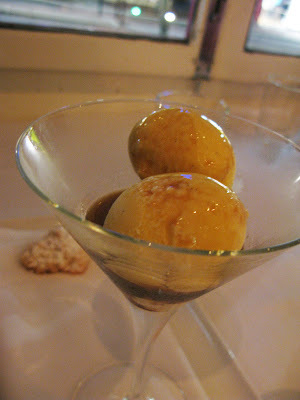 I just look up on Bistro Felix website and they offer different kinds of services like a private room for 16 guest (birthday dinner & etc), they also have a full time sommelier to liase with you regarding your beverage choice and group menus. 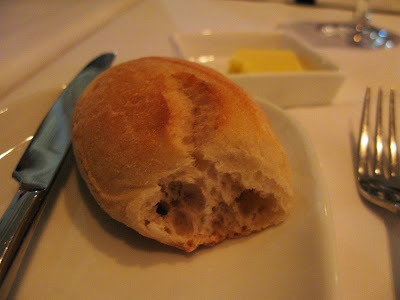 Seated and we were all served with a roll and butter. 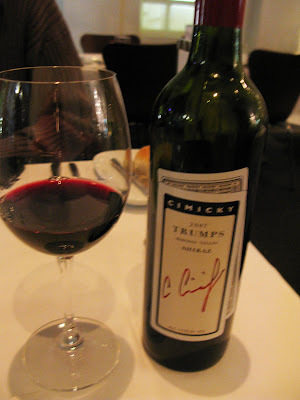 We had a bottle of 07 Trumps. According to Joe, for a 2007 wine, it tasted really good but the wine is still a bit young. I have no idea what he is talking about, but as long as I don't get the strong and sour taste, I'm happy. As you know I'm not a wine person. They have this very interesting menu. It's call the Recession Concession Menu. I guess this really catches customer's attention. 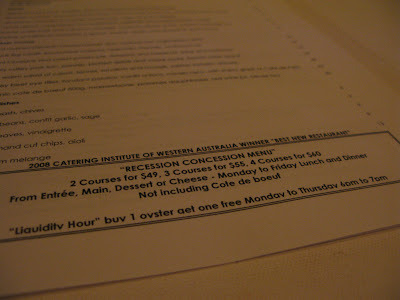 Price is set and they had the Liquidity Hour 6-7pm, where you can buy 1 oyster and get another one free. Yum....but I was there at 8.30pm. No free oyster for me haha. 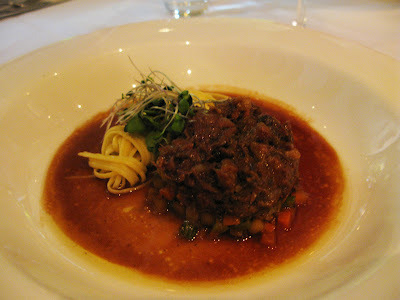 Joe had the Oxtail Ragout, caramalised root vegetables, tagliatteli, black pepper broth and rocket. I have tried a little bit of this, it tasted quite nice. Nicely presented. Salad of cured duck, tangelo, pecan, roquefort emulsion, baby beets. 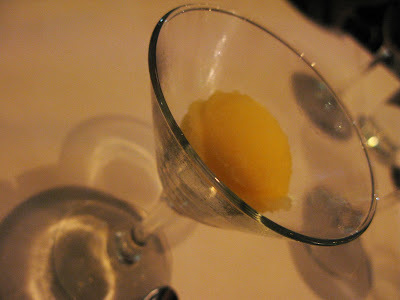 I had this for my entree. 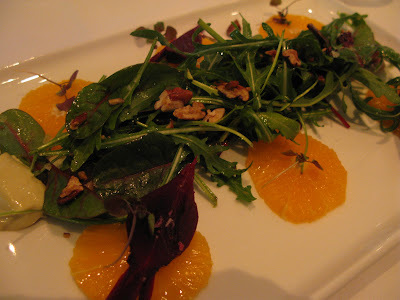 I personally think that this dish is really appetizing, with the tangelo and some crushed pecan nuts, it gives you the refreshing taste. I have never eaten a cured duck before, this cured duck tasted really nice. Bad side of it, too much of the rockets. (I hate rockets) and they served only a few pieces of duck meat. It doesn't give me a feeling that this dish is worth for that price. 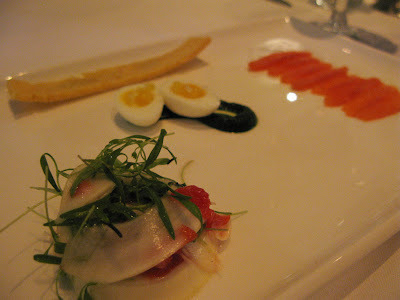 Khrys entree is beautifully done. I didn't really tasted it because it was such a petit dish. I had the tiny slices of fish, fresh! Thats all I can comment about it. Alice's entree look so yummy. Very nicely made sausage. Presents beautifully and tasted good too! 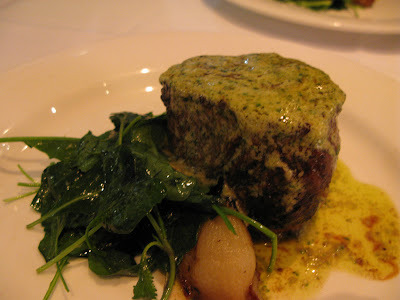 For mains, Khrys and I had the Harvey beef eye fillet, fondant potatoes, confit onions, cavalo nero with Cafe de paris. Yeap, I have no idea what it says but I can say this dish is nice. Khrys and I finish the whole thing and we cleaned up the plate! Loved the Cafe de paris sauce. It's a buttery sauce with nice complex taste. Although I had the medium-well done beef (I ordered the medium-rare, but they somehow mixed it up mine with Khrys's) it was abit tough for me but the sauce it so tasty, I don't even care of the tough meat anymore. 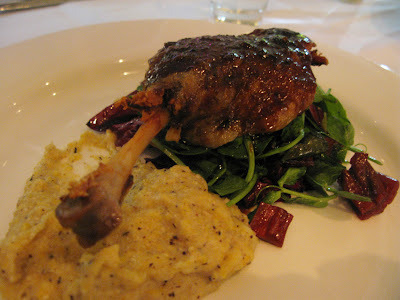 Duck leg confit, buckweat polenta, radicchio, rhubard, mushroom jus. Alice's meal was light and well balanced. 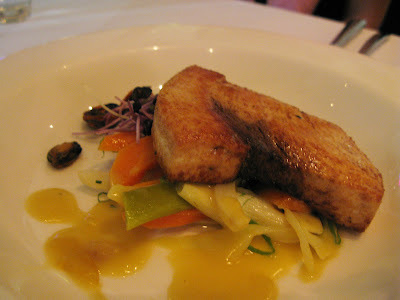 Fish was nicely done, fresh and juicy. 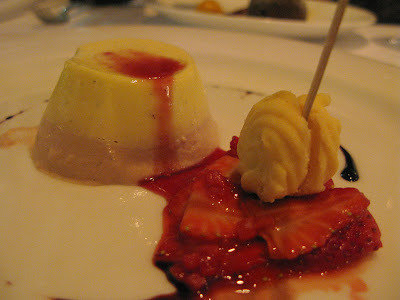 I had the Strawberry bavarois, melting moment, vincotto. Cute lil icecream! Looks like tiny lil eggies! Very smooth. Didn't get to taste the bottom part but ice cream itself is good. 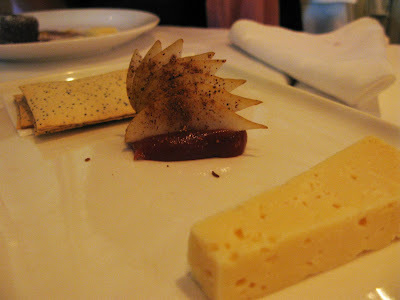 To finish up, we had the Gouda Cheese plate to share. Bistro Felix is open for lunch 12pm-3pm Monday to Saturday. why no take away for me? !